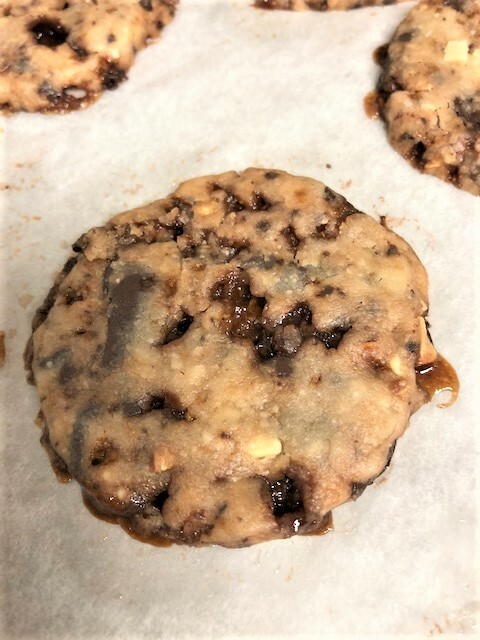 If you are looking for a really good cookie to take to that Christmas cookie party, here is a fabulous one! It’s super easy too. Everyone buys those pink cans of almond roca around the holidays. I think everyone pretty much gets one as a gift too, right? Well, put them to good use and make these cookies. Yum. 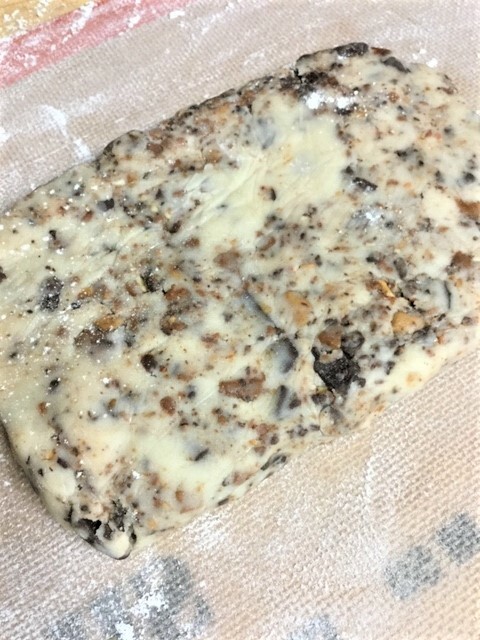 Now, I will admit that I put a little too much almond roca in my dough. It made for a beautiful dough, but the cookies came out of the oven a bit messy. But once they cooled……..OHHHHHHHH so good. It is a great holiday cookie and would make great gifts. 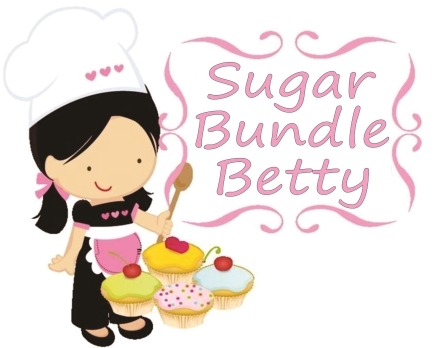 Using an electric mixer, cream the butter, sugar and vanilla together until smooth. Add in flour and salt just until a dough forms. If it’s too crumbly, add 2 teaspoons of water so it comes together. Gently stir in the almond roca bits. Press and flatten the dough into a disc. Wrap the dough in plastic wrap and chill it for 1 hour. Place the dough on a lightly floured surface. Roll the dough to a 1/4 inch thickness and cut out your shapes with cookie cutters. I used a round cutter. You could also just cut the dough into strips. Place the cookies 1 1/2″ apart on a parchment lined baking pan. Bake for 12-14 minutes or until lightly browned. Remove from oven. 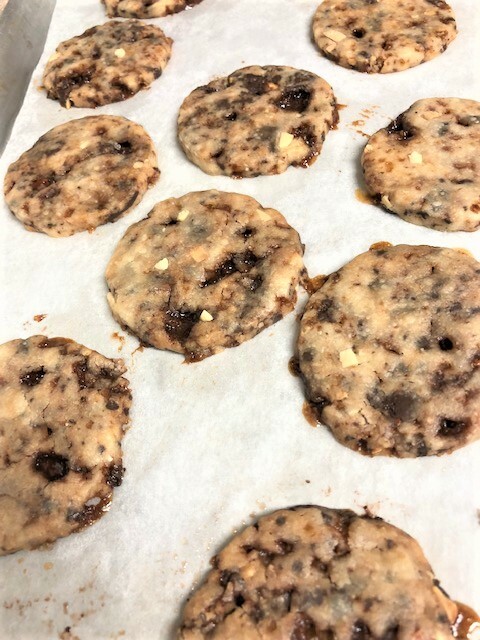 If the roca has made the cookies spread a bit, just gently re-form the cookie with a knife or spatula. Let the cookies sit for 5 minutes. Carefully transfer the cookies to a cooling rack. When storing, be sure to use a layer of wax paper between layers. 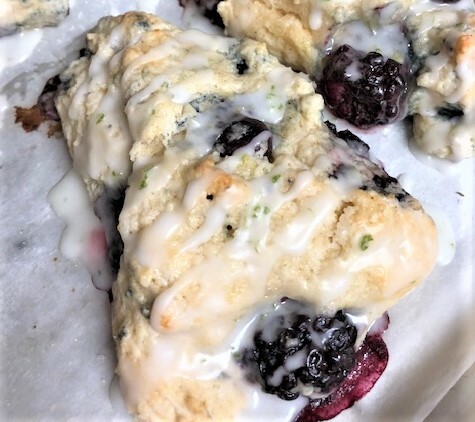 By now ya’ll know how much I love a good scone. They are just so perfect with a cup of hot coffee or tea. I like a tender crumb scone. I never order them at coffee shops, because they are usually dry or hard and you dont know how long they’ve been sitting in their display case. Who wants that???!! I’ve made so many kinds of scones. I’ve made buttermilk scones, sour cream scones, cream scones. 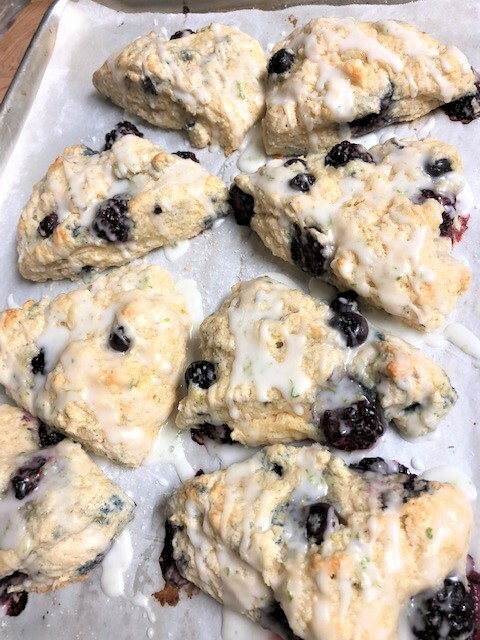 I’ve made fruit scones and even green chile and cheese scones. I love scones. Even a plain, tender scone slathered with some butter and good jam or lemon curd makes me so happy. Just a little tip about making scones. Don’t overwork the dough. It’s really important. I also use really cold butter…..almost frozen and I chill my flour for about 20 minutes. 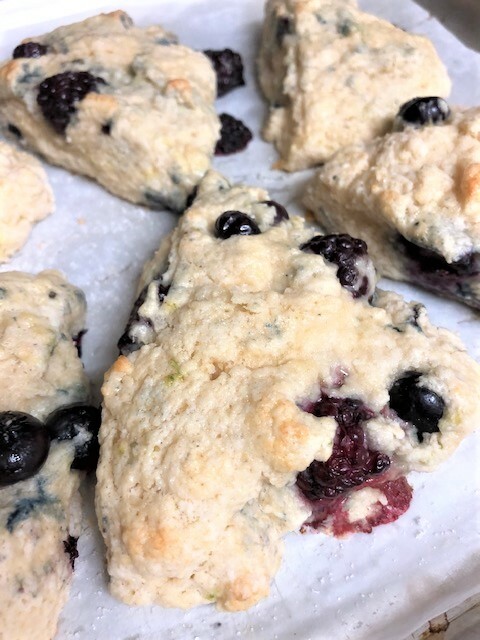 I have to say, these 2 berry lime scones are some of my favorites. Even without the glaze, they are YUM. In a food processor (if you have one), place the flour, sugar, salt, baking powder, lime zest and butter. Pulse in short spurts until you have a course texture. You can also do this in a bowl with your fingers. Dump into a bowl. Stir in heavy cream, egg and vanilla, just until it starts to come together. Add berries. Dump it all out onto a LIGHTLY floured surface. You may still see quite a bit of dry crumbs. That’s ok! Just bring it all together forming a ball. Don’t overwork the dough. Gently flatten the ball to a 1 inch thickness. Cut into wedges. I made 10. Gently lift each wedge onto an ungreased baking sheet, lined with parchment. If you aren’t going to glaze these, sprinkle each scone with a bit of sugar. Bake for 12-13 minutes. Allow to cool at least 15 minutes. If you want to drizzle with glaze, do so now. Just add enough lime juice to the powdered sugar to get the consistency you want.